Diane Hoeptner: Fascination and black squirrels in my yard! Fascination Oil on wood, 8" x 8," $330. A quick re-post of recently re-photographed "Fascination." Also today, black squirrels in my yard! :) If you've never seen one, they're just like regular squirrels except for coloration (though they seem quicker?!) Black squirrels were originally introduced in Kent, OH by a Kent State University grounds superintendent. He and a friend acquired them in Canada. The squirrels flourished and eventually made their way from Kent to these parts. I've seen an albino squirrel in Northern WI but never a black squirrel!! I wonder if you'll paint one??!! 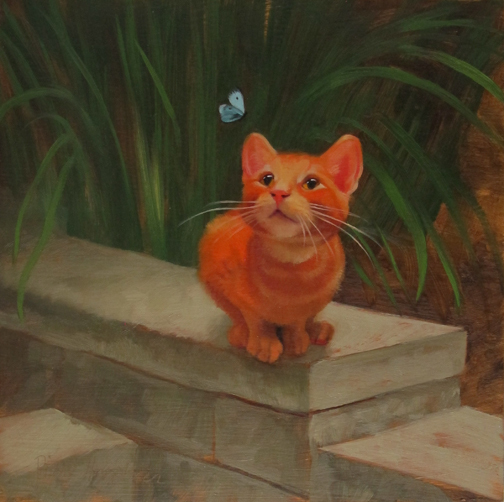 An absolutely adorable kitty painting!!! Ooh, an albino? Cool! Lol, yeah I totally would paint a squirrel!! Thanks, Kathryn!